as well as facilities to meet the absorptive capacity where HH the Amir Sheikh Sabah Al-Ahmad Al-Jabir Al-Sabah representing Sheikh Jabir Al-Ahmad Al-Sabah laid the foundation stone of City of Sabah Al-Salem University with the presence of former minister of Education and Higher Education Dr. Rasheed Al-Hamad on February 19, 2005. In October 2009, In a gesture that carried all meanings of gratitude and loyalty, HH sheikh Sabah Al-Ahmad Al-Jabir Al-Sabah took the initiative to name the new university city by the name of the late Sheikh Sabah Al-Salem Al-Sabah to be ''City of Sabah Al-Salem University''. KU was established in October 1966 under Act N. 29/1966 regarding the organization of higher education and its laws and was officially inaugurated on November 27, 1966 to include College of Science and Arts and Education and College for Women. In April 1967 an Amiri decree was issued to establish two more colleges which are College of Law and Sharia and College of Commerce and Economy and Political sciences. In August 1995 an Amiri decree was issued to establish College of Business Administration and Abolish College of Commerce while in October 1971 an Amiri decree was issued to separate College of Science from College of Arts and Education. In July 1973 an Amiri decree was issued to establish College of Medicine and in December 1974 another decree was issued to establish College of Engineering and Petroleum. 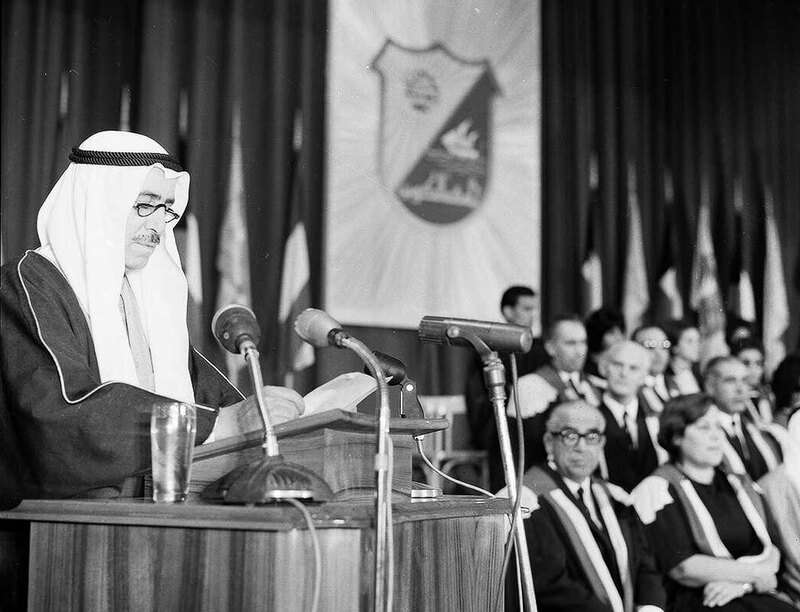 In august 16th, 1977 an Amiri decree was issued to establish College of Graduate Studies. In May 1980, College of Arts was separated from College of Education under the issuance of an Amiri decree to establish College of Education and while 1988 a decree was issued to establish a College of Social Studies. In October 1981 a decree was issued to establish College of Sharia and Islamic Studies while in January 13, 1982 a decree of the Minister of Education and Higher Education and the Higher President of KU was issued to establish a center for Health Sciences and in June 22 of the same year an Amiri decree was issued to establish a College of Allied Health Sciences and Nursing and thus separate it from the programs of College of Medicine. In May 16, 2004 another Amiri decree was issued to amend the college's name to Allied Health Sciences and after two years in February 1996 college of Pharmacy was established in KU while in May of the same year College of Dentistry was established under an Amiri Decree. In June 2001, the University Council has approved to develop the programs of College for Women to offer scientific programs at recent disciplines that meet the requirements of the development plans and the needs of the labor market. KU is striving to develop its academic programs permanently and continuously, thus College of Graduate Studies expanded its programs in 2000/2010 to present doctoral degree helping to provide a greater number of programs and disciplines that the society needs. This is the bright procession of KU that provides it with the strength and motivation to continue to develop in the area of higher education in such scientific and academic harmony to create scientists and intellectuals at all scientific disciplines in order to be pioneers locally, regionally and internationally. "One of the largest educational campuses in the world."